I enjoy reading magazines. A well-written magazine article is a perfect way to learn something new about the world in a relatively quick fashion. A magazine article length is just about perfect for “family reading time” or for other brief opportunities throughout the day. An aside: our family has a pretty regular “family reading time” in which we each read something (or, in the case of the youngest members of our family, have something read to us) for a set period of time. We’re usually all in the same room when we do this. I try to choose a variety of things to read during this period so that the children see me reading a variety of things. A big part of “family reading time” is to encourage reading through emulation. I tend to prefer either magazines that focus strongly on well-edited and well-researched deep writing (like The Atlantic) or magazines that teach me how to do something new (like a good cooking magazine). In our neighborhood, children are often selling magazine subscriptions to support their clubs and other activities, and Sarah and I tend to support them, particularly children that live near us and play with our own children. The result is that we end up subscribing to a few different magazines along these lines. This leads to another problem: magazine bloat. If you subscribe to several different magazines, that means you’re getting the issues in the mail very regularly. That’s a lot of paper entering your home. If you aren’t completely on top of reading those magazines immediately – and most of us are not – those magazines can start building up and cluttering your home. If you hit a busy phase in your life, there’s a good chance that some issues will go entirely unread. I know that during particularly crazy weeks around here, we’ll miss issues of magazines, even ones that we love. If you have “project” magazines and you want to hold on to some of them for future tasks, the magazines will start building up. The end result of all of these things is clutter. Magazines, if not properly maintained, can easily grow into a cluttered nightmare. The easiest solution is to simply trim your magazine subscriptions. Don’t resubscribe to the magazine (or two) that you read the least. This will save you money and reduce the number of issues cluttering your home. 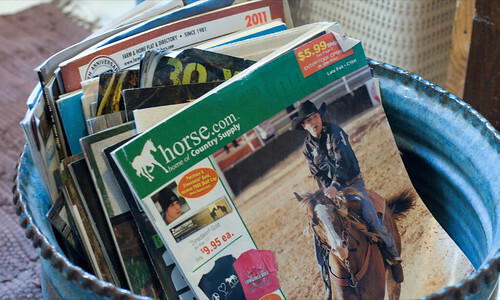 Have an organizing system for your “project” magazines. I love to hang onto issues of magazines that encourage me to do things, like cooking magazines or homebrew electronic magazines. If you don’t have a system for getting them out of the way and in a coherent order, they can cause a real mess. I simply have a closet shelf devoted to project magazines, where I keep all of them. Tear out or otherwise record key tips, then toss the magazine. Don’t keep a full magazine just for one recipe or one idea. Tear out that page and save it, then toss the rest of the issue. Better yet, copy down that one piece of information you want to save in some electronic fashion, whether through scanning or typing it in. If you’re talked into subscribing by a young salesperson, just extend a subscription to something you already get. If a child is on my doorstep and I’m looking at the catalog of magazines they have for sale, I always look for ones I’m subscribed to and intend to keep subscribing to. If the price is reasonable, I choose that one. This way, my subscription is just extended and I’m not facing any new magazines that I don’t really want coming in the mail. Keep your magazines under control and you’ll keep one source of clutter well under control (and perhaps save yourself a bit of money, too).